Chloe knows that "practice makes perfect" and her traveling arena helps keep her ready to compete all the time! She's a super athlete who almost always wins that blue ribbon. Still a filly through and through, Chloe just loves pink! Look inside her arena to see how many trophies she has already won. If you donÕt see her there, donÕt worry, she is probably out practicing! 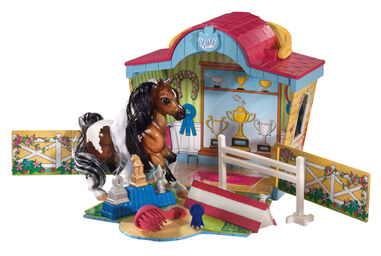 Includes: Arena, 4ÓL x 4ÓH horse, hairbrush, 2 jumps, trophy and ribbon.